Happy 200th Supernatural and since this is my 200th post, happy 200th to me as well. Can’t believe I only started doing this in March and I also can’t believe I started watching Supernatural a decade ago. When I started watching this show I was only 17 and was starting my final year of high school which just feels like a lifetime ago. To get 200 episodes is an impressive accomplishment that isn’t matched by many shows past or present so it is something that is worth celebrating and I’m pleased to say that Supernatural delivers an episode both worthy of the extensive legacy and respectful to the longtime fans. Supernatural has often been a show that likes to have a lot of fun now and again and at times break the 4th wall. There have been episodes that deal with a series of books that make up their adventures, episodes that make fun of the notion of TV and even one where the characters are brought into the real world where they are thought to be the actors in their own TV show. It’s not every show that can get away with such silliness but somehow it sort of works whenever they try it. It’s strange how this show can do intense drama as well as cartoon level silliness. In order to celebrate this milestone, the episode takes the form of mysterious goings on around a musical depicting the story of the first 5 seasons of Supernatural, or in universe all the books that were written. I thought that Chuck had never released books chronicling the 5th season, I remember an episode where he discussed it at a convention but Sam and Dean weren’t to allow it. Is there a later update to that I’m forgetting? If anyone can put me right here I will humbly concede. At any rate the idea of using a high school musical to celebrate such a feat seemed stupid at first but I was really surprised by just how well it worked. Instead of filling the episode with overt cameos from every fan favourite character to adorn the show since the pilot episode we get a nice reminder of most of them through the play. This works better than I could have imagined and gives a flavour of who those characters were and what they were like without any forced appearances distracting the viewer. The young woman playing Bobby was especially notable in a moment that can only be described as “classic Bobby”. The episode was really funny pretty much from start to finish. I liked Dean’s disbelieving looks at what he was seeing and his incredulous defence of what he feels the story should be. He went through a defined character arc in the episode from being dismissive of what he was seeing to supportive and moved. In many ways seeing his life dramatised before him reminds him what is important in his life and serves as a wake up call regarding how important Sam is to him. It does something of a similar job for the audience -or me at any rate- by exploring what makes this show so special to those who like it. Sam takes a little bit of a back seat here but he was never opposed to the concept of the play to begin with. It fits in really well with the current character arcs going on. Sam is trying to repair the relationship and return things to the way they were where Dean is convinced that things will never be the same again. Dean gets more screen time here because he is the one who needs to be reminded of what is important whereas Sam sits back and lets it happen. Not that he doesn’t have some great moments. His face when he was told that if he cut his hair he’d make a good Dean was absolutely priceless for instance. We also get to see him go into old school research mode which is a nice throwback to more innocent times. It wasn’t all fun, games and laughs. Lots of attention was paid to the emotional heart of the show. The basic premise has always been two brothers fighting evil while trying to get along and this episode definitely had the family theme at the core. Most of the exploration of this idea is through the dramatisation of the events but Sam and Dean being the passive observers really reinforces the idea. The fact that they see their lives laid out in front of them and what others find important about their relationship reminds each of them what that means. In terms of the demonic force, the episode treated it somewhat lightly with a foe that didn’t represent too much of a threat but still caused problems. Calliope was a good villain and had some good dialogue, especially her talking about Supernatural in a self aware way. She was more of a catalyst for the story but it’s good to see that they can still rustle up a memorable foe after all this time. I would be remiss if I didn’t discuss the musical numbers. Doing a musical episode is something that went untapped until now and I’m glad that the musical aspects didn’t overpower the narrative. I am surprised at how well written and well performed the songs were. I hope they are released for consumption at some point because I want to have those in my ears. The rendition of Carry On My Wayward Son was absolutely the musical highlight. Using that as the closing number featuring all of the characters in the play really summed up how much that song represents all aspects of the show. A fitting celebration of 200 episodes of a great show. 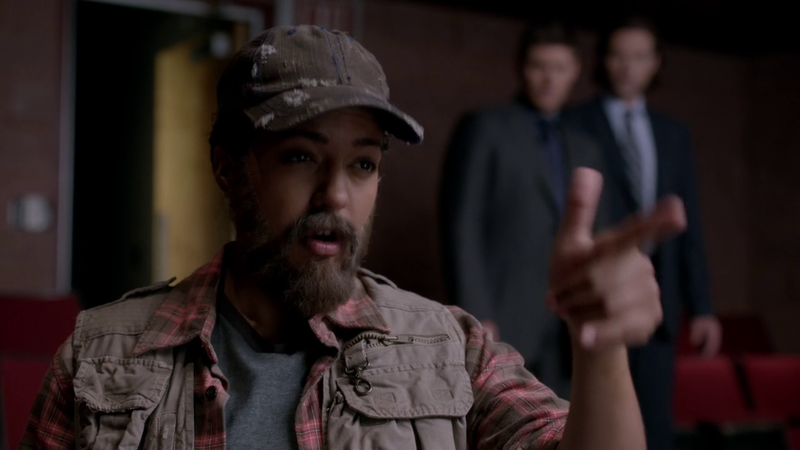 It cleverly reminds Sam and Dean as well as the audience what makes this show great. All of the jokes work and the self referential humour never overpowers the narrative. 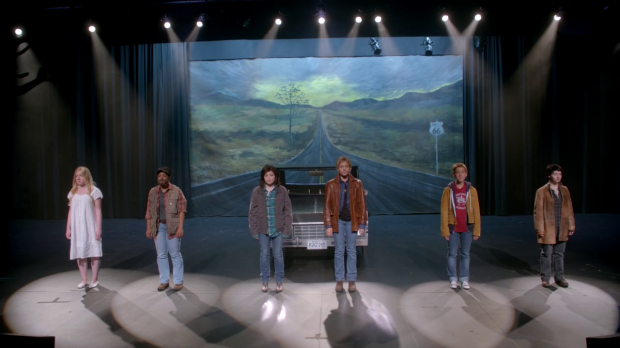 The concept of a musical play inspired by Supernatural allows the episode to pay homage to the variety of characters on the show without peppering the episode with glaring cameos. As an anniversary episode the temptation might have been to make it a disposable side outing for the characters but it still manages to tie everything to the overall character arcs of this season and helps to represent an important turning point in Dean’s recovery. The musical numbers work really well, the songs are cleverly written and well performed with a particularly impressive performance of the unofficial theme tune Carry On My Wayward Son. In general this was just a really fun and moving episode that helped me remember why I love this show so much. This was the perfect love letter to the fans. about the books, the unpublished books were leaked, and it spread online. 🙂 during the felicia day episode about the Djinn? Thanks very much, well remembered :). Nobody seemed to know and my limited research didn’t turn up much. Hope you enjoyed the review.